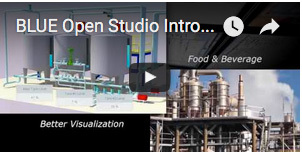 Pro-face BLUE Open Studio is a development and runtime software that incorporates all of the tools users need to create SCADA HMI applications, dashboards and OEE interfaces. It is a collection of automation tools that provide building blocks to develop HMIs, SCADA systems and embedded instrumentation solutions. Utilize BLUE Open Studio integrated Web technologies to take advantage of internet / intranet connectivity.